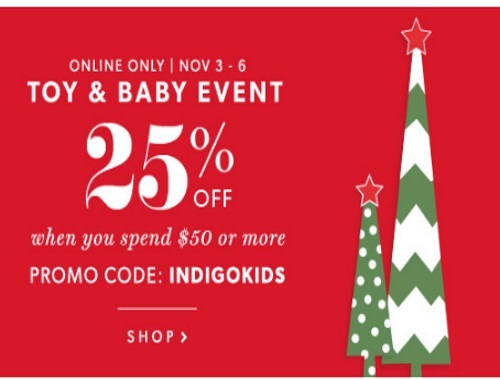 Chapters Indigo has a Toy & Baby Event on now! Save 25% off when you spend $50 or more! Enter the promo code INDIGOKIDS at checkout. Offer is valid online only November 3-6, 2016. Also, they have an in-store Friends & Family Event right now which also includes 25% off when you spend $50, look for your email from Chapters Indigo to get that promo. Click here to Chapters Indigo.